PreK and Kindergarten enjoyed story time with Mrs. Hall in the Annex. 1st grade continued to choose books from the Picturebooks, or Everybody, section of the library. The students are just about ready to begin exploring the nonfiction side of the library. 2nd and 3rd grade quickly reviewed library layout and procedures before choosing great books. We have been focusing heavily on choosing "great fit books" based on vocabulary, comprehension, and interest. 4th grade visited the Media Center for the first time this school year. Students checked out fresh reading material and visited the tech lab to set up school server accounts. Mrs. Santini and I were excited to have the students try Rapid Typing, new typing practice software. 5th grade set up their school server and Google Apps accounts. Mr. Fallon and I were impressed with the students' understanding of big topics like school appropriate behavior on and offline, digital citizenship, netiquette, and safe password selection and management. I had the opportunity to support several teachers as they made final adjustments to their grade level pages before Back to School Nights. The final result is fantastic! Our teachers are making great use of the tools available to them as the continue to extend their classrooms into the digital realm. Some Media Literacy classes met for the first time this week, others are just beginning to wrap up start-up tasks like setting up school server and Google Apps accounts. We discussed the importance of choosing a secure yet practical password, general netiquette, and what exactly is meant by the phrase "school appropriate." 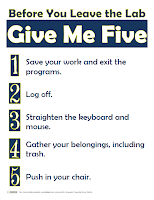 We instituted "Give Me 5" before leaving the lab, a quick 5 step process to make sure the computer stations are left in good order at the end of class. Inspired by my summer reading on Whole Brain Learning, I began to introduce a new teaching technique to my grade 4+ classes. Class-Yes has allowed me to have the entire class's attention in a quicker, and frankly more fun way than my previous attention-getters. Teach-OK helped students not zone out during the less than exciting library reorientation sessions. Students were more focused, engaged, and dare I say interested in the process when they knew they would help teach their neighbor. By listening to students teach one another what I just taught them, I was able to quickly gauge their understanding of the topics. The immediate result was outstanding: fewer students needed direction when locating material on the shelves after a catalog search.